Last week, I was in San Francisco for Daniel Brusilovsky’s Teens in Tech miniConference, as well as for Appnation. 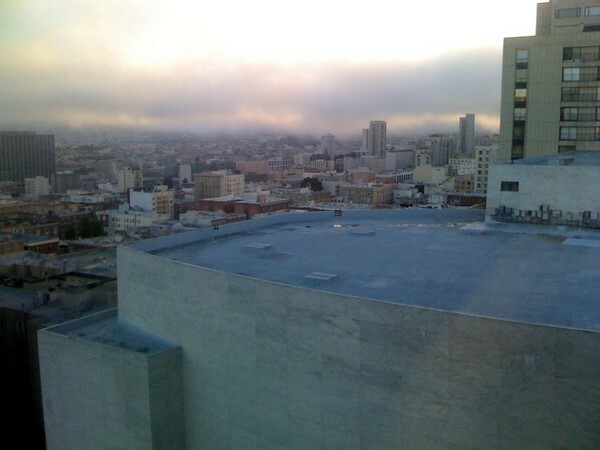 As someone involved with startups and technology, the Bay Area’s reputation has been firmly ingrained in me for years – Twitter, TechCrunch, Salesforce, and of course, Robert Scoble, all call the area home. It’s been awesome to experience the reputation firsthand. When arriving the first night, I was a little taken aback with the ghetto-ness of Union Square at 11 PM, not to mention the fact that the two or three blocks surrounding Powell and Market are usually full of tourists. Its convenience is hard to beat, though; I was within walking distance of a good number of restaurants and stores. From what I can tell, the more local-inhabited areas are mostly on the east side of the city, around the likes of SoMa, Embarcadero, and North/South Beach. Public transit’s pretty comprehensive; between BART, Muni, and Caltrain, it’s easy to get around without having to worry about a car. The majority of my travels were on Muni and Caltrain, though; I only used BART to get to and from the airport. The occasional cab ride was necessary, but that was in situations where it was more of a time-saver than anything else. It’s also a lot more convenient to grab a Clipper card instead of having separate passes for each form of transit. And at the risk of being overly stereotypical, the weather is about as pleasant as I could imagine. The sushi’s amazing, too. 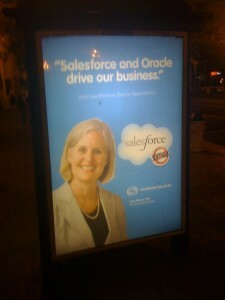 Tech is embedded into every part of San Francisco. QR codes are everywhere, it’s hard to spot a mobile device that’s not an iPhone, and I even heard someone talk about getting a Kinect demo unit while standing at a crosswalk. It’s incredibly invigorating to be right in the center of everything, like my RSS reader coming to life. All the people and startups out there used to be some surreal, upper-level abstraction that I read about, but now it’s right in front of my eyes. There’s multiple tech gatherings on every night of the week, with a good distribution of different crowds at each. I also find it fascinating and refreshing that no one (aside from the bouncer at 111 Minna) asked me how old I am or where I went to school. 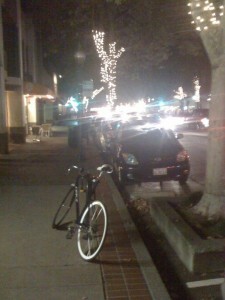 When the conference wrapped up on Saturday, I decided I’d head down to Palo Alto and meet up with some other entrepreneurs. I left the hotel around 7, mistakenly thinking it’d be a quick shot down on Caltrain. I got down there around 10 thanks to delays at Hayward Park, and still hadn’t heard from anyone. I ended up finding a place called Pizza My Heart (couldn’t resist the pun) and caught up on some blogs. Although I didn’t get back to SF until midnight, I don’t regret the perspective I gained, seeing more of the Stanford-adjacent college town than the crowning tech pinnacle I was expecting. The next morning, I met up with Zach Ware, someone I’d known on Twitter for months. We had a great conversation about the future of location-based services, social dashboards, and how to bring all the fragmented information on the web to a central location. We also talked about the upsides and downsides of being a generalist or specialist, a topic I’d been struggling with recently. 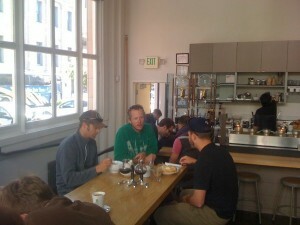 The location, Blue Bottle Coffee, had some of the best coffee I’ve ever had, right up there with Atlanta’s Octane. I’m not sure how they brew it, but there was some kind of crazy, Chemex-esque setup in the back. 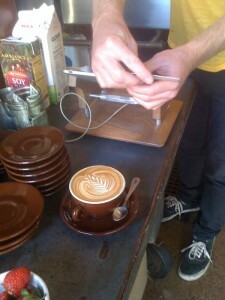 I took the rest of the day to work on some new features for Rank ‘em, and had a conference call later that afternoon. Having read about it a while back, I figured I’d work out of Sightglass Coffee, as they were one of the first to adopt Jack Dorsey’s Square iOS payment system. Though I’m not sure the barista got my “It’s hip to be Square” joke, the coffee was once again excellent, as was the user experience of the Square app (on-screen signing with a text alert of the charge). On Monday, I managed to swing a tour of Apple Campus. 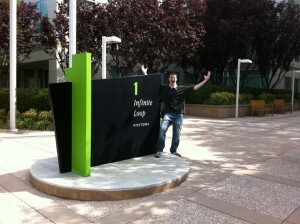 With a much better approximation of how long the trip would take, I arrived at One Infinite Loop well ahead of time. The architecture and design of every inch was as if it were a giant Apple product; even the trash cans had matte bags with Myriad Pro signage. Upon entering the front door, nothing was modest – a huge iPod touch sign hung from the ceiling, the back courtyard was filled with buildings, offices and was centered by a large patch of grass. It’s one of the most motivational work environments I’ve seen; there’s almost a zen aura surrounding the buildings. I’m not a “fanboy”, strictly speaking, though – I’d strike the same pose at Microsoft, Facebook, or Twitter. Afterwards, I headed back into the city to take a shower and swing by the Appnation opening night party. It turned out that the venue, 111 Minna, was 21+, though. Even after walking up and seeing the gigantic “21+” sign plastered on the wall, I figured it’d be at least worth a shot to attempt entry. Unfortunately, the cool-guy bouncer was pretty good at basic math, so I was out of luck. I ended up grabbing some delicious sushi at Sanraku while beginning to outline this blog post. For the majority of the next day, I was tweeting and taking notes at Appnation, which will be detailed in a successive post. After the main event was over, I made my second attempt at the next Appnation party, which proved to be successful. 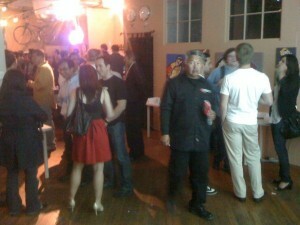 Held at pariSoma, it was definitely an above average event, with a younger crowd and loud music. I enjoyed meeting some of the IntoMobile and Flurry staff, as well as some independent app developers. On my final day, I met with Appcelerator‘s Jeff Haynie in downtown Mountain View. Other than my late-night trek to Palo Alto, this was the only time I saw “urban” Silicon Valley; it’s refreshingly different from San Francisco, although both have their own unique character. It was great to talk to Jeff and get some more perspective on doing a tech company in the Valley. Directly outside the window was the building where Netscape was created, and Mozilla, LinkedIn, and PayPal offices were a stone’s throw away. My biggest takeaway from the conversation was the reiteration that iron sharpens iron, and that it’s hard to ignore the connections a startup can benefit from by being in the Valley. That night, I was sitting down having a little trouble getting some code to do what I wanted, so I decided I’d take a short walk to clear my head. 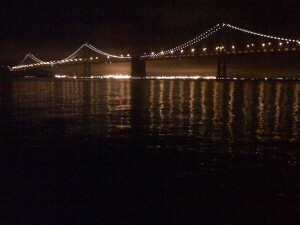 But I kept walking and ended up finding myself at the water’s edge overlooking the Bay Bridge. It was absolutely beautiful, and I found myself having a bit of a Double Rainbow moment, coupled with thoughts on life, love, meaning, and achievement. And then I saw a Google Street View car and started manically running to try to grab a TwitPic, which was a good reminder of who I am and what I live for. Leaving the next day was definitely a bit of a bittersweet moment. 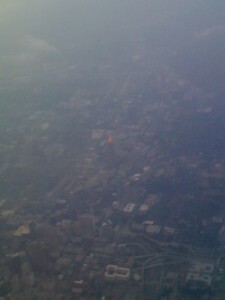 As many people I’d met and as much as I’d learned, there’s some undeniably awesome people back in Atlanta. This wasn’t the last time I’ll be in the Bay Area, but tomorrow also isn’t the last day I’ll be in Atlanta. The Valley doesn’t radically change everything, but does provide more insight into my long term goals. Eventually, it’s where I need to be living and doing business. But not right now, not today. This entry was posted on Sunday, September 19th, 2010 at 5:48 pm and is filed under Business, Events. You can follow any responses to this entry through the RSS 2.0 feed. You can leave a response, or trackback from your own site. Sounds like San Francisco was a dream come true for you. It’s a city that has been able to evade me for some time now, but I do hope to visit this Spring. A good friend of mine is taking a job out there with high5 – hi5.com/ and I am definitely going for a visit. How did you go about meeting all of these people and attending all of these events? Any tips for someone new to the social media scene? Was it more or less awkward that you thought to meet people in person you had been talking to online for months? glad to hear you’ll be making it out! as for meeting people, etc. – make sure you throw it out on Twitter when you’ll be there and send a few DMs. also might want to look at ReadWriteWeb’s event calendar; I was somewhat lucky that Appnation happened to be going on when I was in town…didn’t plan that or anything. let me know how the trip works out! Definitely gonna check out readwriteweb. Thanks for the help!